Many students graduate college with the intention of starting over somewhere new. Others choose to return to the campus and give back to the place that gave them the knowledge and opportunities to be successful in the first place. Three UWGB alumni are doing just that. Jolene Sell, Daniele Frechette and Joe Hanrahan returned to give back to the college and its dining experience. Jolene is a former member of the Cross Country team at UWGB. Through her team, she gained a family and a passion for nutrition. While attending UWGB, she noticed a lot of changes could be made to improve the nutritional value of food students were eating. After graduation, when the position of Campus Dietician opened up, she was happy to return to the place that felt like home. Daniele had strong ties to the campus, being a UWGB alum. Here she feels a strong sense of community and a place of belonging. As the Marketing Director of Dining Services she feels like she has her dream job. There is always something new she gets to learn to make students’ lives better. Joe stayed closely connected after he graduated. Even though he worked in Appleton as a retailer post-graduation, he felt his ties to UWGB grow stronger due to him staying on campus as an alumni board member. As his relationship with the UWGB community changed from student to alumni, it evolved once more when the position of Assistant Marketing Director of Dining Services opened up; it turned out to be a perfect place for the Phoenix Finance Major. The dining services at UWGB have undergone many changes in the past few years. 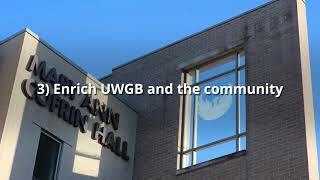 Its current team of UWGB alumni is striving to bring varied dining options for their alma mater. Daniele, Jolene, and Joe want people to know they’re accessible; they want to know your experiences. The main focus of their job is to serve students and give them the best experience possible, whether that means providing allergy safe options, switching to Starbucks, or providing healthy alternatives students can cook in their own dorm! They’re listening and want to give the students the value they are paying for. Previous Post - Previous post: Who’s writing your story?